Chicago, IL. Language: English and Persian. Publisher: Bahai News Service; Committee for the National Spiritual Assembly of America. Editor: Albert R. Windust and Gertrude Buikema, and Zia M. Bagdadi; Persian Editor, Mirza Ahmad Sohrab; then Stanwood Cobb, editor, Mariam Haney, associate Editor. 2/1, March 21, 1911-1935. $1.00-$3.00 a year; 20 pp. Volume numbering continues that of Bahai News; with the issue of November 1922 the journal was called The Bahai Magazine, Star of the West, and then The Bahai Magazine. On the journal, see the entry under Bahai News. 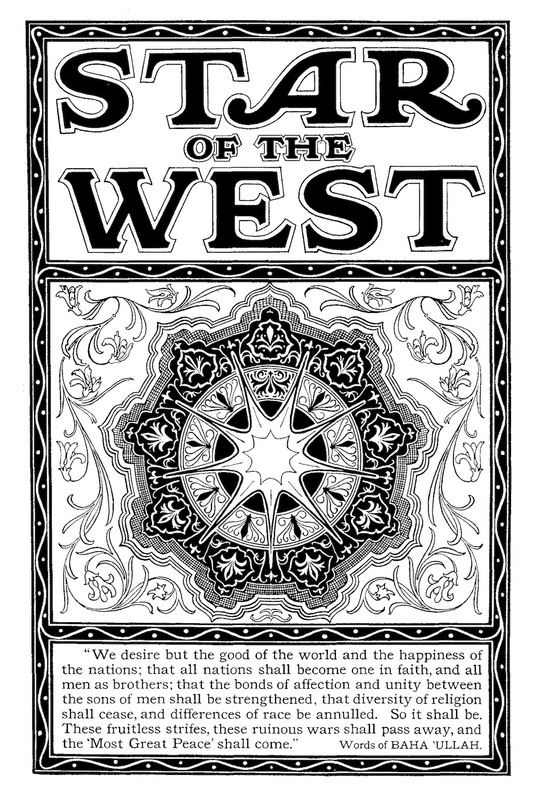 With the passage of time and the domestication of Bahai in America, the journal increasingly carried articles by Westerners explicative of the teachings of the movement. NYPL; Columbia University; Swarthmore College, etc. This material sourced from Star of the West Archive and reprocessed.